During the war, 757,000 apartments were damaged and 639,500 were completely destroyed on the territory of the Soviet occupation zone. These figures do not include East Berlin, where another 230,000 apartments were completely destroyed. In 1946, there was a shortfall of around 1.5 million apartments in the Soviet occupation zone; this was due, in part, to the influx of refugees and expellees, which caused the population to swell. 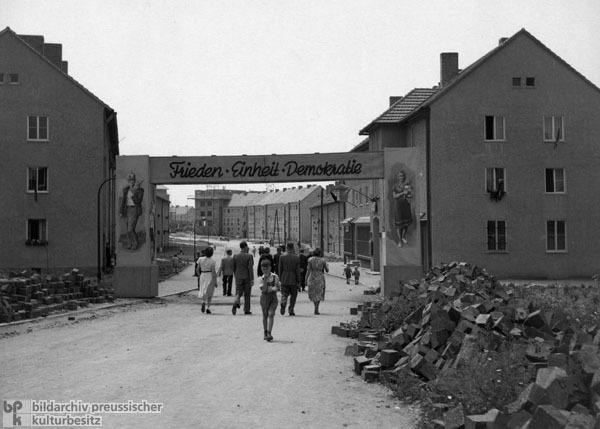 About half the damaged apartments were repaired by 1950, but insufficient new construction meant that between 1.2 and 1.4 million apartments were still lacking when the GDR was founded in 1949. Since supplies were in short order and priority was given to rebuilding industry, only 33,250 apartments were built in 1953. While 10.3 new apartments per 1,000 inhabitants were constructed in the West that same year, the ratio was just 1.8 new dwellings per 1,000 inhabitants in the East. In line with Soviet Stalinist models, East Germany continued to favor national stylistic traditions until the mid-1950s. As in the West, most of the urban residential dwellings constructed were five-story multi-unit buildings. It was not until 1955 that the GDR turned to industrial construction methods; this not only resulted in larger numbers of new residential buildings (in 1960, for example 80,489), it also paved the way for an aesthetic rehabilitation of architectural modernism and the incorporation of the International Style. Photo by Edelgard Rehboldt.